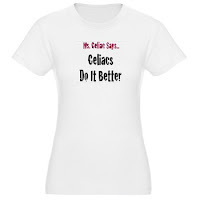 Ms. Celiac Says...: Catch Up Time! I hope you all had a great gluten free weekend! I was able to get around to baking the Betty Crocker Gluten Free Brownies on Friday and they turned out just perfect! They were chewy and chocolate-y! In even better news, Ms. Celiac Says will feature a contest this week in which we will be giving away a Betty Crocker Gluten Free Dessert Mix Gift Set to 1 lucky reader courtesy of MyBlogSpark. Next week, Ms. Celiac Says will be devoted to the bakeries, products, and restaurants of Los Angeles, California. So, please stay tuned for that exciting feature! I also wanted to remind everyone about Ms. Celiac's Market. You can access it by clicking here: Ms. Celiac's Market. It is a wonderful place to find all of your favorite gluten free products in one spot and makes for simple grocery shopping! We currently carry over 270 gluten free products and are always updating our store with the latest and greatest items! Also, why not check out Ms. Celiac's Shop where you can purchase either a t-shirt or tote bag that displays your gluten free pride. Just click the above link to view our latest selection.